A computer case that looks great and functions even better. With a front organizer compartment padded construction that secures your laptop and multiple pockets that hold everything from cell phone to passport. The bottom opens to slide down the handle of any wheeled piece of luggage, for convenient travel. On the Outside, soft, lightweight padded leather adorn the case. Multiple pockets add extra storage. An organizer area complete with removable boarding sleeve with ID screen and credit card slots. A padded, adjustable shoulder strap provides comfort handling. And rubberized bottom soles make this case virtually indestructible. 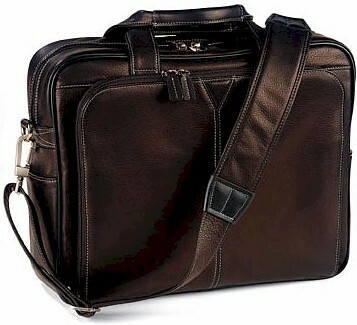 All these features found throughout the Johnston & Murphy briefcase collection. In the Inside, this fully lined piece has generous room for lap top, accessories, PDA, cell phone and all other business essentials. All Johnston & Murphy pricing includes Free domestic shipping and more. Also, no sales tax if shipped to anywhere outside the state of Michigan. On line ordering is of the highest level secure format. We have been in business for over 50 years and offer 30 day Money Back Guarantee. All Johnston & Murphy pieces are backed by Manufacturer's Warranty. We also can gold hot stamp your initials at no extra charge, just specify desired initials under "Special Instructions" when placing order. Order on-line Today. Call Toll-Free (877) 370-2353 for friendly staff.